Organization is my calling. I love the idea of sitting down at the beginning of the week and brain dumping out a good old fashioned to-do list! I also sit and plan a to-do list before each day. But just because I’m writing out daily to-do lists doesn’t mean they were the most effective lists. 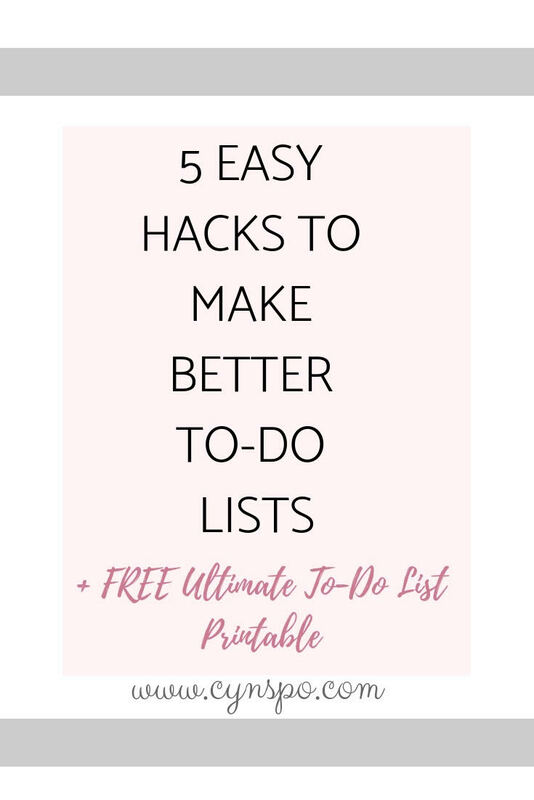 Let me show you 5 easy hacks to make your to-do lists more effective. Writing a to-do list seems simple enough no? Just throw down what you need to do and get to it? There’s actually a better way to go about this. By strategically structuring your to do lists, you can actually get more from them. This means you are likely to get more done, which increases your productivity. You may feel as though there’s nothing wrong with how your to-do list is currently functioning, but theres always room for improvement. Slapping down ideas onto a to-do list can be an effective way to get them all on paper, but a brain-dump* styled to-do list is not what you want. *Brain-dump: the process of sitting down and writing everything that comes into your mind non-stop. Getting everything out on the paper all at once. (ie. Everything inside your brain out onto the paper). Although a brain-dump is helpful for realizing what you need to get done, there is usually no rhyme or reason to which order tasks get put down. This means that an idea with a lower priority may make it to the top of the list before something that is way more pressing. Naturally, our eyes migrate to the top of the list, making that lower priority task suddenly the number one thing to do. Let’s let these 5 easy hacks change your life! I’ll keep this short and to the point because we already talked about this earlier! This is key to ensure your brain-dump doesn’t become your to-do list. You should be building your to-do list from your brain dump! You can do this with scrap paper or use the free download I have created for you! Just take a minute and write down every task that’s on your mind and get it all down on paper! Once you’ve gotten everything out in the brain dump, you can go back and sort your tasks from most pressing to least! This can either be done with a highlighter or you can use the handy little boxes on the free printable! Go through your list of tasks and see what needs to be done today, and what can wait! When you re-write your list, make sure you write in order of most important to least. This way, when you work your way down the list you’ll be hitting the most important tasks first! This can be useful if you use colour to organize yourself already. If you don’t this can be a fun new way to introduce colour coordination into your to-do lists! For example, I’ll explain the system I use! For concrete, regular, every day tasks, I write them in black pen (no special colour for them, they’re every day items). Blogging and related tasks are written in pink. That way I know it has to to with my blog! Anything financial is written in blue, and any shifts I have at work/work related tasks I write in green. You can see how I use certain colours for certain tasks. This helps me organize myself even further, and that way when I’m looking quickly at my task list, I can see where the focus is for that day. You can choose a colour system that works for you! I have been using this system so long I no longer have to write a colour legend in my planner! This is a new addition to my already existent to do list, and I have to say it is a game changer. For those days that truly get away from you, or plans change, this completion legend is a little gentler on your self esteem. This is the legend I have adopted from a bullet-journal inspiration I found on Pinterest. I have modified it to use the part of the legend that is useful to me! If you would like to see the full legend, you can do so here. I have found this task completion legend one of the best ways to make your to do list more effective! That way you can see your progress and also analyze your total productivity! Are you starting a lot of tasks, but not completing them? Do you have to migrate and move around a lot of tasks? You will be able to see what’s holding you back and where you need to change things to better suit your schedule! This sounds intimidating but hear me out. Realistically, you probably have more than one list on the go that you unintentionally created. We do this because realistically, everything has a timeline. Some tasks don’t need to be done every single day. This is why I have daily, weekly and monthly to-do lists. This is the ultimate prioritization technique as I am putting the lowest priority items onto the monthly list, while keeping the higher priority tasks for daily lists. The good news is, with the printable you can download, you can print it off more than once to create 3 different lists! Did any of this help? Let me know in the comments! I like your 5 hacks for your to do list. I like to use the color coding method. I do priotize as much as possible. I am going to think about making 3 different lists. I’m glad you found this helpful! The colour coding is my personal fav! I need to create more detailed lists like the ones you are describing. I think you’ll find they help! It is so helpful to do! I swear by them! Can’t wait to see if you like them! Thank you for these great tips. Upgrade my lists. This is so awesome!!! I love all the tips you have included here 🙂 Thank you so much, I need to step up my organization game. Can’t wait to hear if you try them! Thanks for reading! I love the idea of separate colored pens per task! Seriously my most effective hack to date! This really made my inner organization freak squeal in excitement. Great list! I’m so glad to hear this! I felt the same way writing it! I LOVE writing lists so this post really spoke to me! I always write out daily, weekly, and monthly to-do lists. And while I have a few pages for a brain dump in my bullet journal, I haven’t used them yet. Sitting down and writing everything down sounds like a great idea. Thank you! I’m so glad to hear another fellow 3 lister like myself! I definitely recommend trying out those brain-dump pages! I really REALLY should start to do lists! I need to get better about doing the things I say I a going to do. Yes you should!! It’s so much easier to prioritize when the tasks are on paper! I’m glad you find this helpful! I hope you are able to incorporate them! You make a good point about how to-do lists can be made more effective. Are we having lists for the sake of having it or do we want to accomplish something? Oooh I like the idea of having a brain dump list, at least separated. I LOVE COLOR CODING!! It helps a TON – great for visual representation. You can never have too many lists, especially when they’re organized. Thanks for sharing! It’s so true! My previous to-do lists lacked these effective tips, and I found I wasn’t able to get as much done! I actually enjoy making lists. They give me so much peace. This was very interesting to read, thank you! Me too! I hope these tips were helpful! I really enjoyed reading this!! I have a lot of difficulty with my to do lists. Thanks for sharing your great advice! I’m so happy you enjoyed it! I hope it helps! I was too, don’t worry! They’re just part of the process! Great tip about your brain dump not becoming your to-do list – I think I fall into that trap sometimes! I use Trello (free app) for my to-do lists. It helps me with re-ordering and color coding. Thanks for sharing your tips! Ouh I’ll have to take a look! Good to know there’s an app for this! I’m a pen and paper person myself, but I understand my followers may not be! I’m glad there’s technology for this! Thank you for your help! I love the idea of color coding things! Me too! my most useful hack! Great suggestions. I especially like the idea of using colour coding which is something I utilise at work, but not so much in my day to day life.